People who enrolled in APECET-2017 do want to know the exact schedule of their AP ECET Hall Ticket 2017. But, is it that easy to know that? Of course, it is! This is because we have published this article which comprises of the vital data. So, what information can you expect in the Andhra Pradesh ECET Admit Card 2017? Is it the exam date that you are thinking that it will contain? Or you are counting on it because it is the valid document that will let you get entrance to the exam? Both are right since it carries the information about Exam Date and people who carry it will be able to go through the exam hall gate because invigilators will be checking it to verify who you really are, viz. if you are the one who enrolled for the admission. Latest News (26.04.2017): The Hall Ticket for AP ECET have been announced now. Grab the direct download link at the beneath side of this page to download them. You will need you 'Registration Number' and 'Date of Birth (DOB)' to download admit card. Do you know the main reason why the APECET 2017 Hall Tickets are released and why people look up news on the Internet about them? These tickets are just like an entry card without which you cannot even imagine your presence in the exam. We’d tell you the complete procedure to obtain your E-Admit Card which is what anyone with even the least knowledge can do. However, we always welcome those who face any difficulty while obtaining their cards. The availability of the Hall Ticket is said to take place on 20th April of this year i.e. 2017, not 2018. When it comes to knowing the Exam Date, the idea that comes on our mind is 3rd May 2017. Yes, it is your Exam Date and on this date you have to appear for the exam. The timing of the exam will be from 10:00 AM to 1:00 PM. At various exam centres, this test will be organised and only those who possess the E-admit card will be able to participate in it because those who don’t own the E-Admit Card will be debarred from the exam. Now, it is up to you what you choose. There are some highly recommended guidelines for the candidate to follow. The test is based on the recommended syllabus and set in English language only. From important guidelines, we actually mean the steps to follow while making you comfortable in the Online Test. You have to use only the recommended one. When you are going to attend the exam after getting AP ECET Admit Card, you can only use single ink for Ball Point Pen, such as Black or Blue, not Black and Blue. Before beginning the exam, make sure you are entering the information correctly otherwise you might be disqualified. The questions will be asked from Mathematics (50 Marks), Physics (25 Marks), Chemistry (25 Marks) and Engineering (200 Marks including various trades). 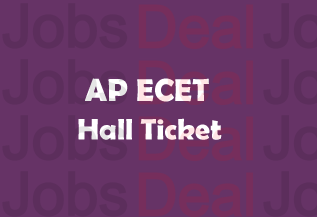 Do you want to get full details on AP ECET 2017 Hall Ticket Download? If yes, you can directly log on to the link mentioned at the last side of this page. There, you have to enter “Username” and “Password” to authenticate and submit the data easily. The conduction of this CBT (Computer Based Test)/ Online Test will be done at different exam centres, such as Vizianagaram, Anantapur, Guntur, Kakinada, Visakhapatnam, Tirupati, Vijayawada, etc. Initially, log on to www.apecet.org. You have to find out the link of Hall Ticket and enter it. Enter the required information carefully and submit. Wait for a couple of seconds and see what happens. You will see a link of AP ECET Hall Ticket 2017, which you have to click on in order to download it for online exam i.e. CBT. Make sure you use the official link that we have furnished below. If you have any trouble, feel free to ask us.